The amazing clear waters of Maya Bay, in Koh Phi Phi. 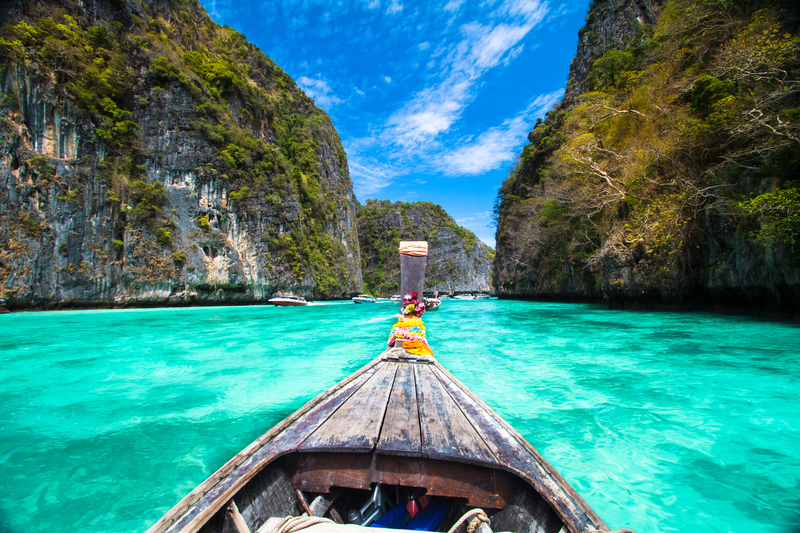 You can spend days soaking up the sun in Koh Phi Phi or easily organize a day trip from Phuket. 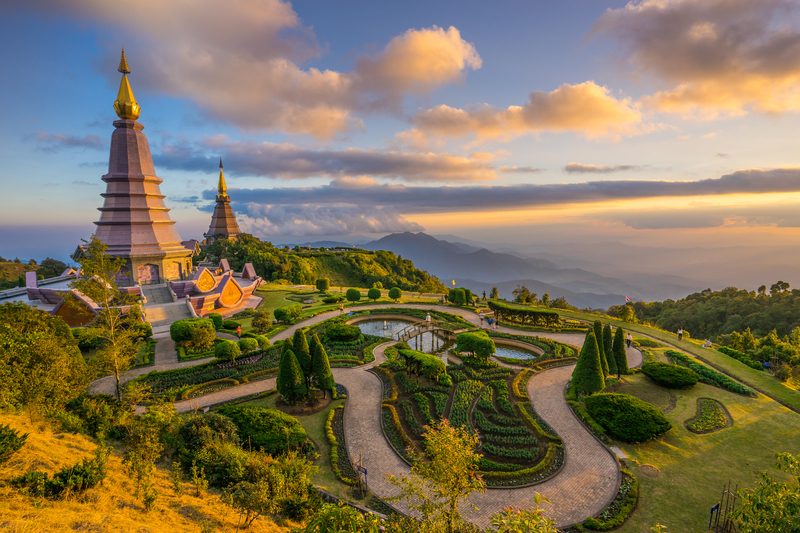 The beautiful temples of Chiang Mai. This lovely city in the north of the country has more than 300 temples! Rent a motorbike and go admire the sunset from the top of the hills! 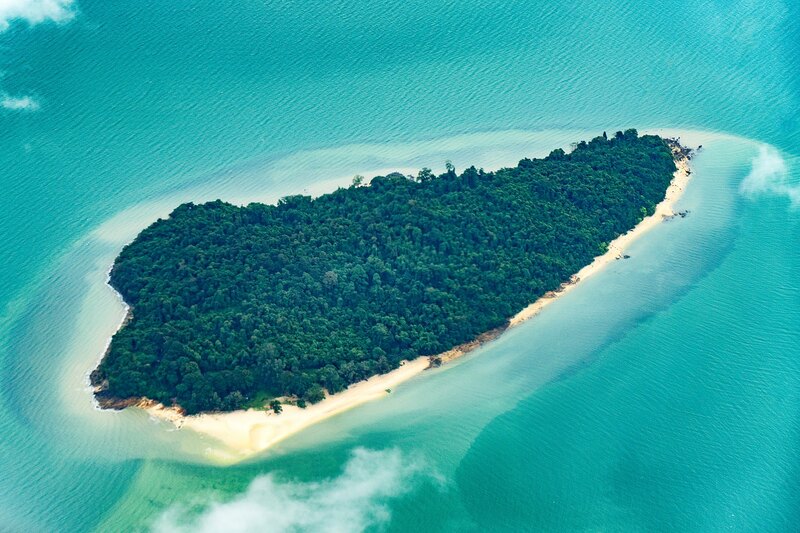 An aerial view of Ang Thong Marine National Park, near Koh Samui. 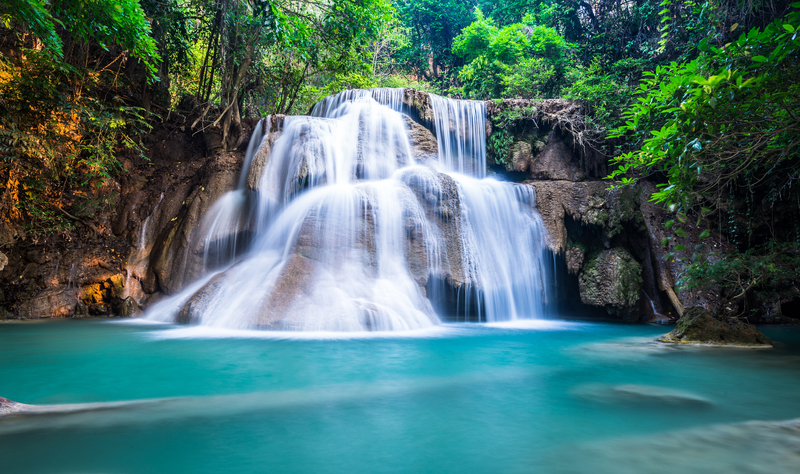 The Erawan Falls in the Erawan National Park are famous for their emerald green ponds. Make sure not to miss also the Death Railway and the River Kway Bridge when visiting the Kanchanaburi Province. 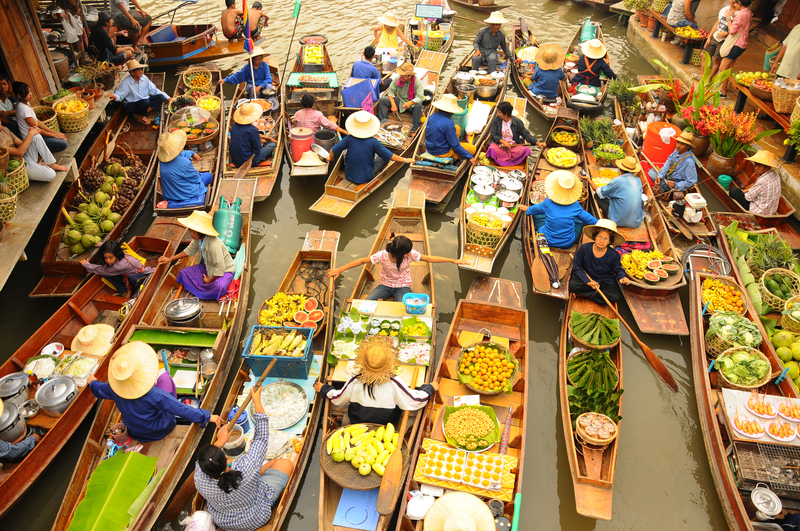 The famous floating markets are a great place to bargain and buy fresh produce, or just to admire the very colorful show. 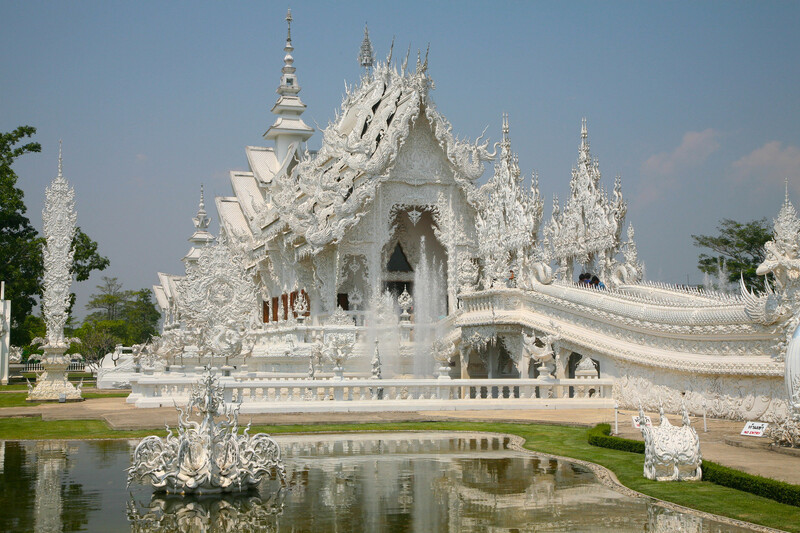 The most famous one is the Damnoen Saduak market, which is located about 1.5 hours from Bangkok. Elephants playing in Chiang Mai. Many tourists heading to Thailand can’t wait to meet these very smart animals. Please, PLEASE, make sure you practice responsible tourism though. Elephant trekking is a big no-no, as well as visiting those parks that exploit the elephants for profit. Do your research before visiting an elephant park. My tip? 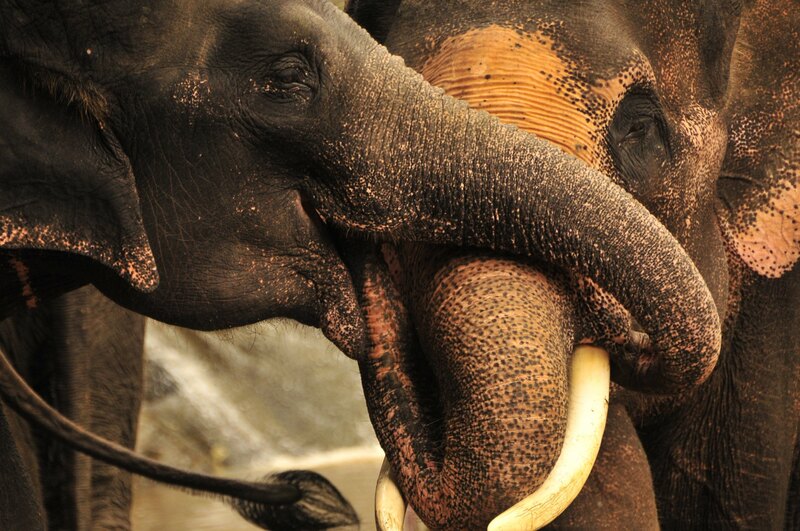 Head to Elephant Nature Park in Chiang Mai, where you can interact with rescued elephants in a fun and respectful way. 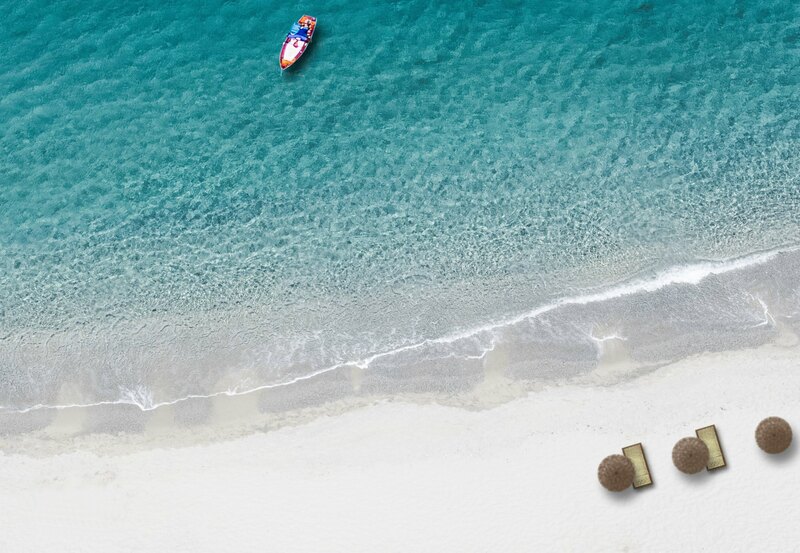 An aerial way of one of the many white-sand beaches. Pure bliss. 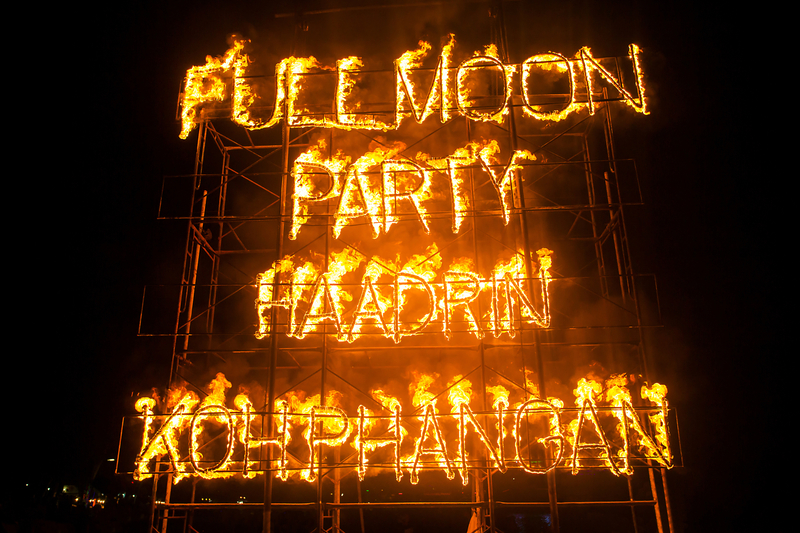 Party lovers can’t miss the Full Moon Party that each month drives tens of thousands to Haad Rin Beach in Koh Phangan. Fun is guaranteed! A Karen woman in Mae Hong Son. 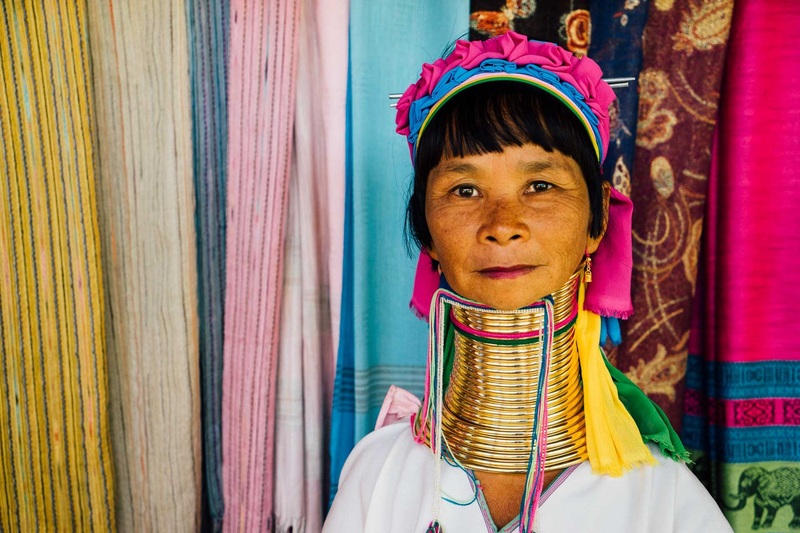 The Karen-Pa-Dong Hill Tribe are also known as “Long Necks”. An aerial view of heart-shaped Keao Yai in Rawai, Phuket. Does it get more romantic than this? 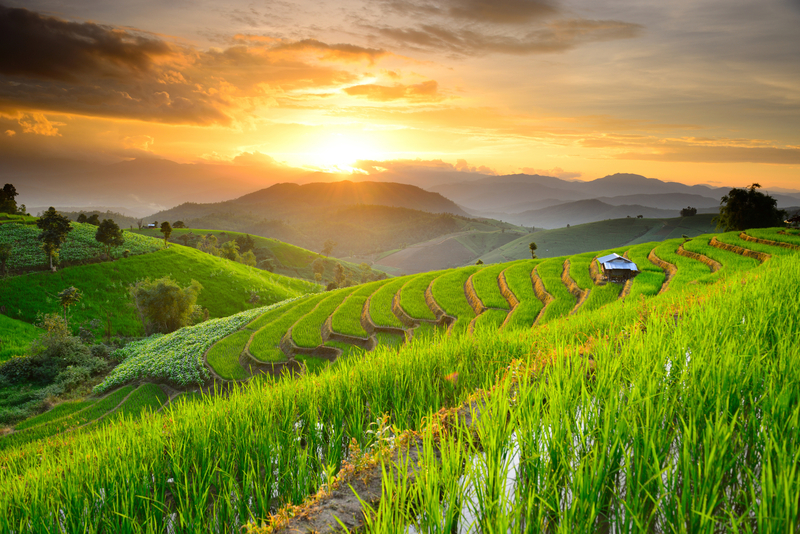 Rice terraces in the north of Thailand, a mesmerizing landscape. 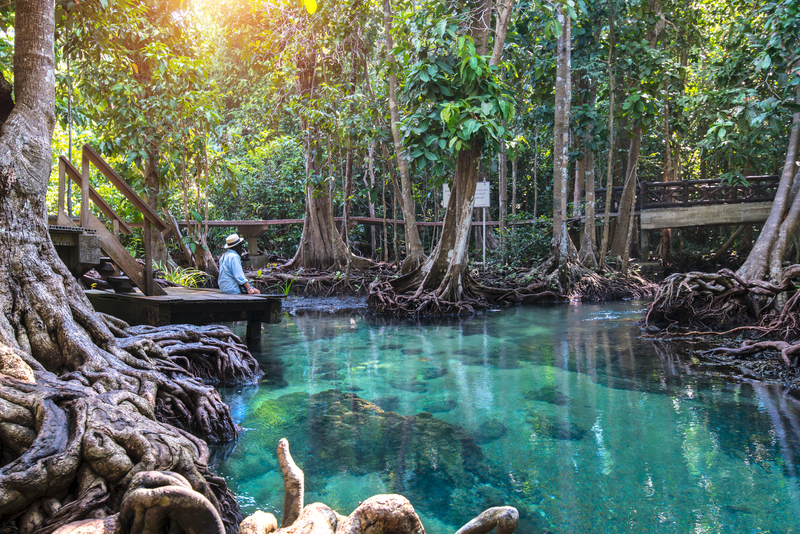 The Emerald Pool in Khao Phra Bang Khram Nature Reserve, in Krabi. You can swim in this natural pool that is filled with pure spring water after a pleasant hike through the forest. 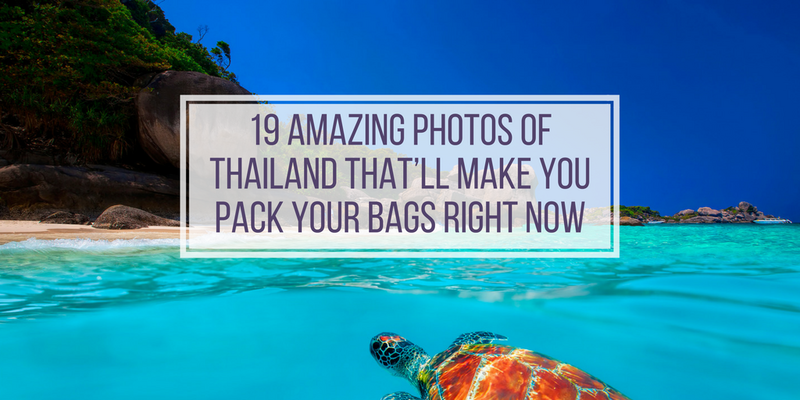 A trip to Khao Sok National Park in Southern Thailand will blow your mind. It’s one of the best eco-friendly destinations in the world too. Go hiking through caves and hills, get speechless while boating around the Jurassic Park-like karst formations, and spend the night in one of these floating bungalows. 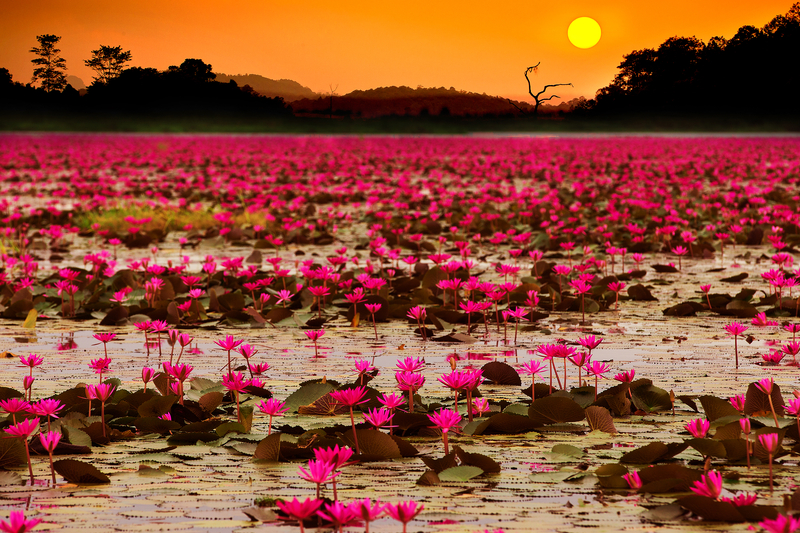 The Red Lotus Sea in Udon Thani, northern Thailand, is home to millions of lotus flowers, which bloom between December and February coloring the lake pink. Lanterns during the Yi Peng Festival in Chiang Mai. 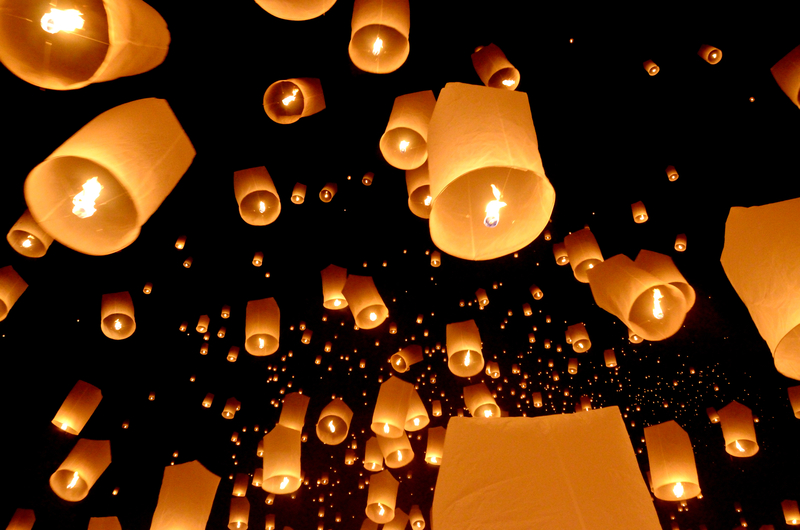 Each year in November – the dates usually coincide with Loi Krathong – people release sky lanterns at night and it’s just beautiful. 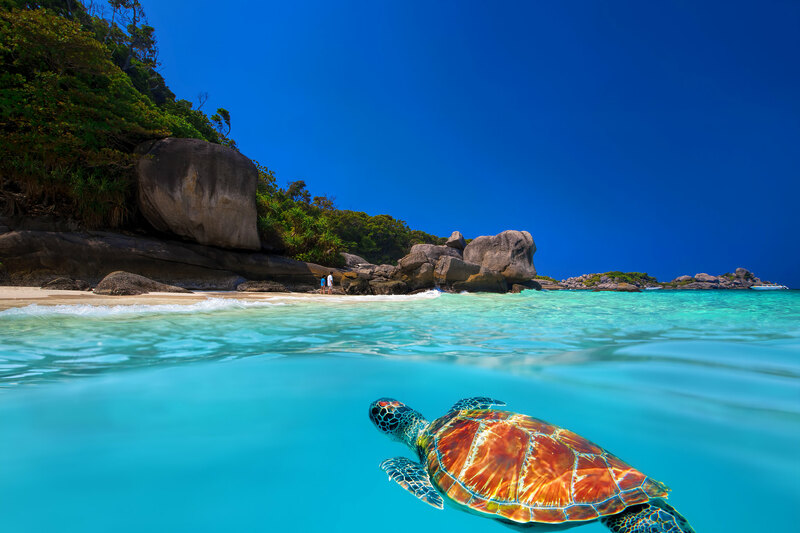 Green Turtle at Similan Islands. 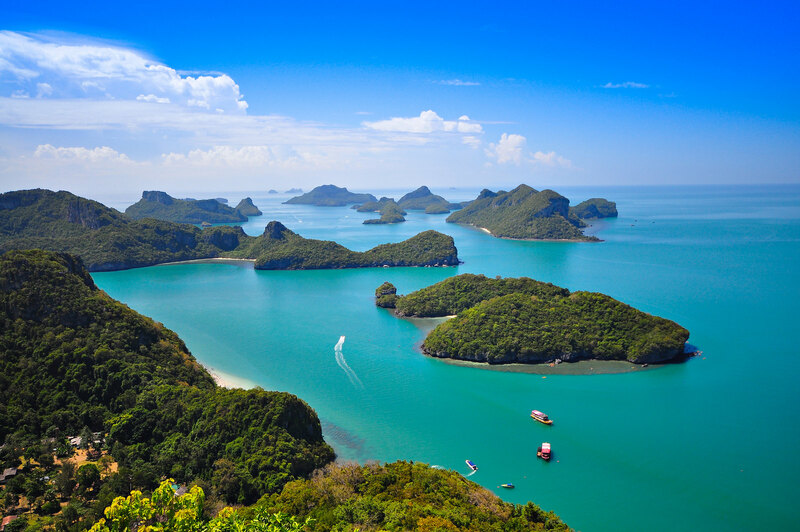 These islands, just 84km northwest of Phuket, are a great place to snorkel and dive thanks to their coral reef and diverse marine life. 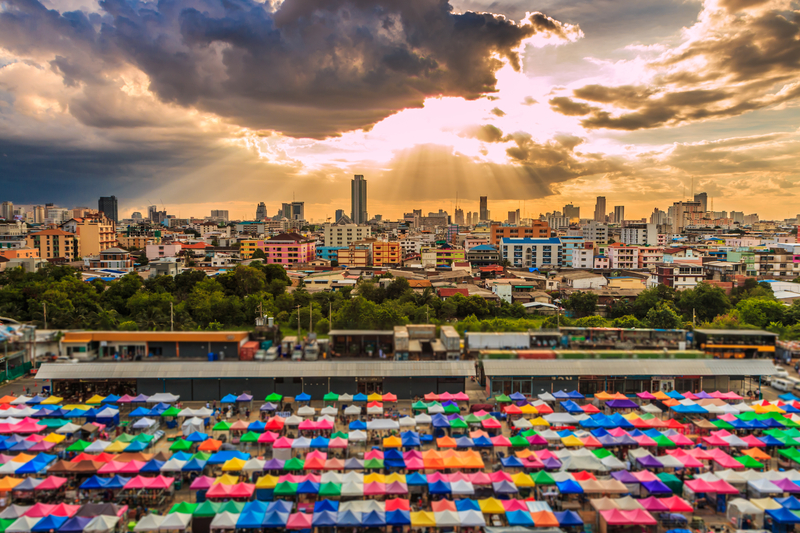 Bangkok’s skyline and one of its colorful markets. Bangkok is great for shopping! James Bond island in the Ao Phang Nga National Park, one of the most famous images of Thailand. 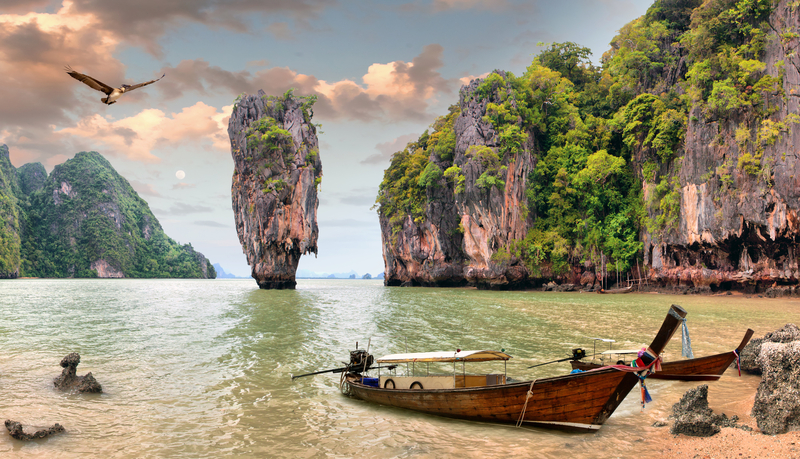 You can easily visit this natural wonder with a day trip from Phuket or Krabi.